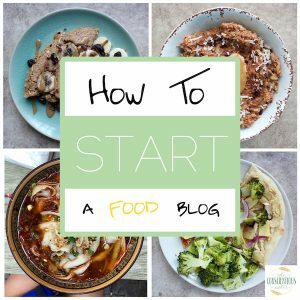 I’ll be getting back from Chiang Mai, Thailand right when this post goes live. Hopefully I’ll have some photos and highlights to share with you, but it’s more of a work trip than a play trip, so we’ll see what I come up with. But you better believe I ate all the thai curry, spring rolls and vegan goodies while I was there! Chiang Mai is a vegan’s paradise and I’m so thankful we get the opportunity to go so often since we moved to China. fall as well. 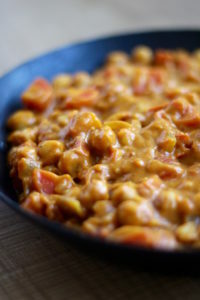 I love how versatile and easy to throw together most curries are and I make them all throughout the year. 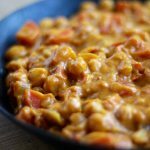 Since we’re are in the midst of fall, it’s inevitable that I’d post a pumpkin curry like this Pumpkin Coconut Chickpea Curry! This curry couldn’t be easier to make as there is minimal prep and the bulk of the ingredients come from cans–which actually doesn’t sound too appetizing when written out, but it truly is delicious. I love how the coconut milk and the pumpkin puree give this dish the creamiest of textures and the chickpeas have so much staying power to keep you full for hours. 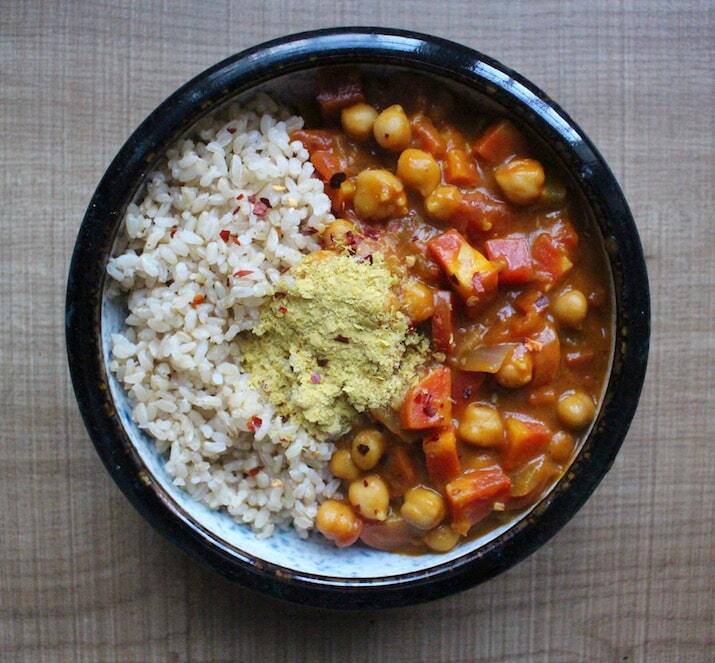 I hope you give this simple and delicious vegan Pumpkin Coconut Chickpea Curry a try. If you do, please let me know your thoughts in the comments below. Or even better, take a photo of the finished product and let me see your creation by tagging #theconscientiouseater on Instagram! 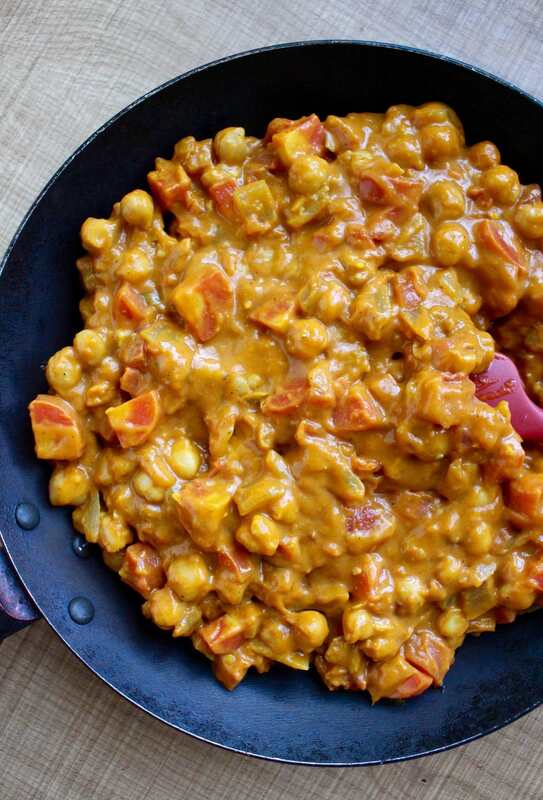 Made with creamy pumpkin and hearty chickpeas, this Pumpkin Coconut Chickpea Curry is perfect for the colder fall and winter months! In a large pot, saute the chopped onion, minced garlic and grated ginger in some water until the onion is soft. Add in the dried chili and spices and allow the spices to cook for about 1-2 minutes until fragrant. Add in the next 5 ingredients, from the chopped carrots to the chickpeas, leaving the lemon juice and cilantro for later. Stir all the ingredients together well and allow the curry to come to a boil. Then reduce the heat to a simmer and allow everything to cook for about 15 minutes, or until the carrots are softened. Squeeze in the lemon juice, plus more salt and pepper to taste. Serve the curry warm with rice and/or fresh bread and garnished everything with cilantro and more lemon wedges. Wow! I just made this today replacing the chickpeas with chicken. I’m a meat eater. Oh, it is soooo good!!!! Awesome! So glad it worked out for you Oscar! I made this yesterday and it was amazing!! I’m new to cooking and I’m trying to gather some recipes so that I can get a few dishes on rotation and get some practice in the kitchen, and this is definitely a keeper! Thanks music to my ears Miranda! 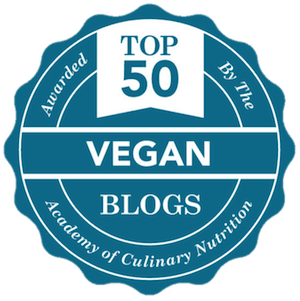 Thanks so much for sharing your results!